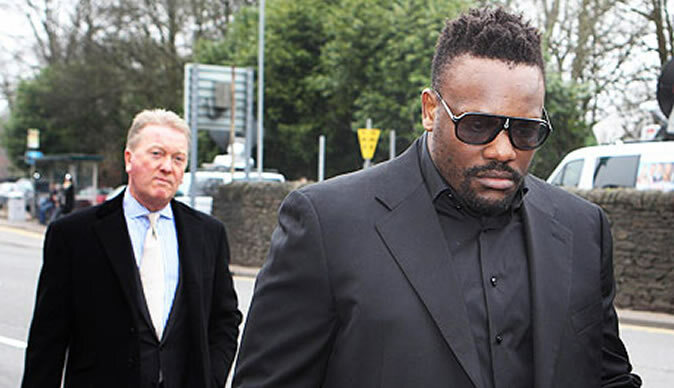 ZIMBABWE-BORN heavyweight boxer Dereck Chisora has appealed against the withdrawal of his licence, and his manager claims a grudge match against David Haye is inevitable. The British Boxing Board of Control (BBBofC) indefinitely removed Chisora's licence as punishment for his conduct before and after last month's WBC world heavyweight clash with Vitali Klitschko. Among the 28-year-old's indiscretions was his brawl with Haye at the post-fight press conference, and Frank Warren believes the simmering feud between the two must be settled in the ring. "It's a natural fight, it doesn't matter what anyone says," he said. "It's a bigger fight than either of them fighting Wladimir or Vitali Klitschko. "There's lot for them to fight about - in a proper environment. "I do see the fight happening. It's the proper forum for them to settle their differences." The BBBofC withdrew Chisora's licence, deeming him "not a fit and proper person" to hold one after the controversial incidents that marred his title challenge against Klitschko on February 18. Having slapped his opponent at the weigh-in and spat water at the Ukrainian's brother Wladimir just prior to the contest - which he lost on points - he then fought with Haye in an incident that was investigated by German police. The BBBofC hearing lasted four hours but Warren, Chisora's promoter, is unsatisfied with the way it was conducted. "The appeal has gone in already. The grounds for the appeal are that we're not satisfied with the way the hearing went," he said. "There was also no chance to review any evidence before the hearing. All I want to see is a fair hearing. "Dereck Chisora will present his side of events and then we'll see what happens. "A lot of stuff came out at the first hearing. For example we thought (BBBofC chairman) Charlie Giles was in charge but it turns out there was no steward from the BBBofC representing the British boxer's interests. Instead he was working for the WBC. "We wanted him to give evidence at the hearing but he didn't. They said he was unavailable yet he was in the building and left by the back door. "He didn't even put in a written report which is strange given what happened and that he was there." Three obstacles would have to be overcome for Chisora and Haye to meet in a fight that would generate enormous domestic interest given the animosity between the two. Haye is still wanted for questioning by German police over his role in the brawl that shamed the sport and, having retired, he must reapply for his license with the BBBofC, who are sure to take a dim view of his behaviour.